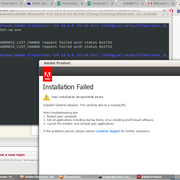 I am having a strange problem when trying to install Illustrator CS6. It doesn't matter if I use PlayOnLinux or directly install it with wine the problem is still there. I don't know what to do next, any help would be really appreciated.